In 2017, Instagram added an additional 100 million users to their platform and there are no signs of slowed growth in 2018. There is a reason Instagram is growing at an incredible clip. The average person turns to Instagram to access remarkable photos and videos produced by friends, influencers and brands. Companies rely on Instagram because users are 10 times more likely to engage with brands than on other platforms like Facebook or Twitter. In order to unlock Instagram’s potential, however, it’s important to create an Instagram profile that successfully captures the attention of target audience members. By following the tips outlined below, social media marketers can optimize an Instagram profile to drive meaningful business outcomes. Over 25 million businesses are already using Instagram Business accounts to access helpful analytics and promotional tools. Unlike personal accounts, Business accounts provide users with analytics related to post performance and follower growth. Business users have the office location and hours in a section separate from the traditional Instagram bio. Since 80 percent of Instagram users follow at least one brand, Instagram allows Business accounts to include a contact button that sends a message via Instagram direct message, email or SMS to the brand representatives. This makes social media customer support far easier than before. Last but not least, Business accounts can “boost” content with just a few taps. This relatively inexpensive paid promotion ensures that you reach a wider audience no matter what post you choose to boost. Simply put, an Instagram Business account provides social media marketers with greater flexibility when it comes to creating an effective social media presence on Instagram. Perhaps best of all, existing Instagram accounts can easily switch to a Business account with just a few taps. Considering that Instagram allows social media marketers to share only one live URL across the entire platform, the link in an account profile is incredibly important. However, many marketers still make the mistake of using a non-tracking link in their Instagram account profile. If the link cannot be tracked, it’s impossible to know how many website visitors or customers were referred from Instagram. Using an Instagram analytics platform or a custom URL builder like Bit.ly, marketers can see how Instagram users are engaging with the link in the bio. Instagram marketers should design a profile that makes a statement. There is no better way to do this than by creating a multi-grid collage that forms a comprehensible image. Brands like Rolls-Royce rely on this technique to share large images that might not look right when cropped to fit within a single post. Best of all, when brands upload a series of images that are indecipherable, it can cause followers to become curious. Many will choose to visit your Instagram profile to see the full image for themselves. In this example, Rolls Royce uploaded nine images that together displayed the front profile of a recently released model. The only way to know if your Instagram strategy is working is if you have the analytics to prove it. While an Instagram Business account does offer some basic information about performance, third-party analytics platforms provide a wealth of information that is otherwise inaccessible. From calculating the performing of the tracking link in your Instagram bio to determining which posts resonate most among followers to pinpointing the ideal time to post new content, a third-party analytics tool is essential to optimizing your Instagram profile and strategy. Sometimes it can be hard to know if your Instagram bio is serving your social media marketing goals. The best way to understand if your bio is effective is via an A/B test. To get started, you’ll need to first select a dependent variable that can be measured. One popular dependent variable is tracking link URL clicks. Next, create a variety of noticeably different Instagram profiles and rotate them evenly to ensure that each bio is displayed to roughly the same number of followers for roughly the same amount of time. Finally, look at the URL performance data to determine which profile was most effective at generating URL clicks. Many Instagram marketers think that having a large number of followers is important to create a fully optimized Instagram profile. After all, the more followers a brand has the more credible it often appears. 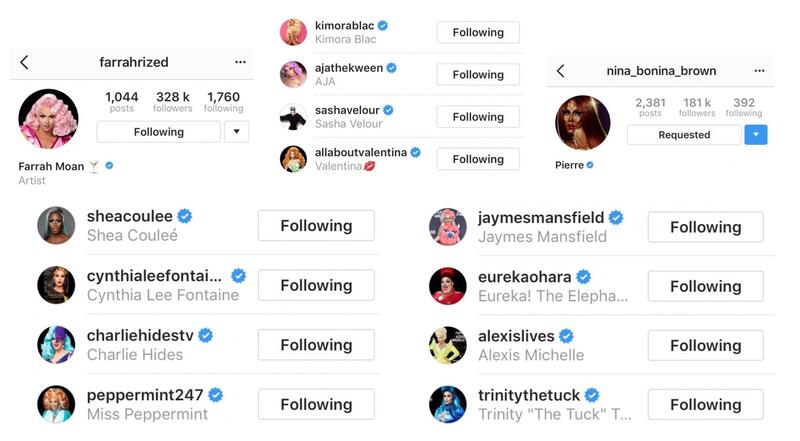 But a quick look at Instagram profiles owned by some of the largest companies in the world shows that follower quality is more important than quantity. There are countless “clickbait” Instagram profiles with hundreds of thousands, if not millions, of followers. These profiles have far more followers than, say, the 42,000 that Salesforce, a company with a $74 billion market cap, can claim. And yet, despite their lower follower count, no one in their right mind would think Salesforce is a lightweight company. Social media marketers should focus on developing a strategy that engages the target audience rather than boosting the numbers of followers just to project an air of credibility. Unlike other social media platforms, Instagram content isn’t really buried in one’s profile. Instead, it is relatively easy to see every post dating back months, if not years. Marketers should be mindful of this and should develop a thoughtful sequence of cohesive Instagram content to create a profile that puts forth a comprehensible brand narrative. Make sure that you and your team are in a position to respond to your target audience at a moment’s notice by turning on Instagram notifications. Showing Instagram users that your brand is always available is a great way to build brand sentiment and increase engagement. Assuming you haven’t created your Instagram profile yet, take the time to find the ideal Instagram handle. Using a handle that is on-brand is the best way to quickly build a loyal following. If your desired handle is taken, it may be possible to pay the owner of the handle to take possession of it. Many consumers expect to receive nearly instant customer support on a variety of social media platforms. Furthermore, the average person will share the story of a negative customer service experience with 16 of their friends. As Instagram grows in popularity, it will be increasingly important for brands of all sizes to provide users with satisfactory customer support. And since Instagram Business accounts provide profile viewers with the ability to contact brands with the touch of a button, customer service requests could easily come at any hour of the day. Given this reality, social media marketers should consider assigning someone to monitor incoming Instagram messages during working hours. Most Instagram marketers don’t think about updating their Instagram profile, but doing so can be a great way to keep the profile fresh and relevant. Adding logo variations or designs specific to a marketing campaign can encourage followers to check out your profile more frequently than they might otherwise. Similar to Twitter, Instagram offers established brands the ability to receive verified account status signified by a blue checkmark. This checkmark will give Instagram followers peace of mind, as they are assured that your account represents the official voice of your organization. While Instagram does not provide the general public with a way to submit a verification request, Mashable has reported that there are ways to get an Instagram account verified through more creative means. Instagram, like Facebook, is a mobile-first company. Before there was ever a desktop or tablet version of the Instagram app, there was an iPhone and later an Android version of the platform. Instagram marketers should review their company profile on a variety of devices to make sure that the experience is positive and consistent across all devices. For those interested in driving website traffic from an Instagram profile to a company webpage, be sure that the entire company website is mobile optimized. Most Instagram users will be accessing your page from a mobile device, and providing a poor first impression can seriously hurt your chances of nurturing the visitor to become a loyal customer. In addition to providing a mobile-optimized experience, page speed should be lightning fast on all devices. One study found that mobile sites that take 3 seconds or longer to load lose over 50 percent of visitors. Instagram is about having fun with various forms of media. One way to do that through your Instagram profile is to use emojis in your company bio. A few emojis can take the place of words, giving you a few more characters to write a compelling bio. It also helps to show that your organization is capable of relating to younger users, of which there are many on Instagram. Developing a fully optimized Instagram profile capable of engaging Instagram users will require an organized plan of attack and plenty of patience. Being able to measure performance and being willing to make changes in reaction to the numbers will put you well ahead of the competition.